If there is one way hotels outbrain Airbnb in today’s experience economy, it is by beating the giant at its own game: through glamping. Creating glamping tents for rent in the outdoors is something that costs little and boosts revenue (big time). But what glamping tents! Some time ago, the media were raving about St Jerome’s, a hotel in Melbourne which offered its guests a brand new luxury camping experience: twenty bell tents decked out in fine bed linens and thick quilts. If there is no news about hotel tents costing $330 per night, equipped with minibars, electric blankets and, of course, free Wi-Fi, then maybe there is some consolation in the fact that they were installed on a… rooftop! St Jerome’s is reportedly in high cotton ever since it decided on expanding into glamping. Clients on TripAdvisor hype about getting a room ”literally on the city,” and tag it as unique, cool and classy. No wonder, lush outdoor apartment overlooking a bustling urban setting (paired with top hotel service) is something worth ladling out your money. Thanks to the invention of glamping, hotels now find it easy to expand their offering and transform travel for hundreds of guests who are looking for an alternative to hotel rooms. They get that alternative from none other than a hotel which, apart from standard accommodations, happens to be having glamping tents at its disposal. Another fine example of hotels seamlessly adding glamping to their table comes from a holiday centre nestled in the snows of Finnish Lapland. Harriniva Hotels & Safaris now offers ”glamping under Northern Lights” and under…canvas, while the temperatures outside reach minus 20°C or lower. 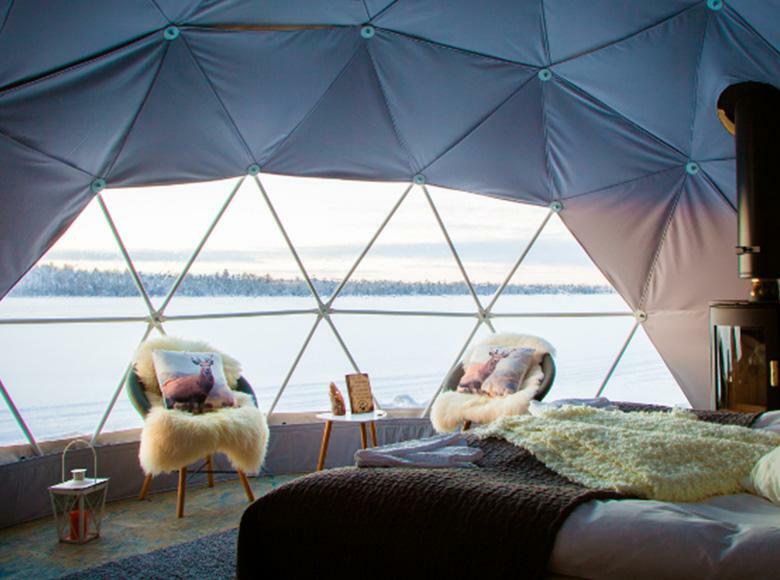 Luxury stay perfect for two is organized in a warm lush tent with a log-burner and insulation, overlooking spectacular color displays of aurora borealis, and named thusly — Aurora Dome. There is a 1940’s boutique hotel in Berlin, Das Stue, which got inspired by the glamping trend and all, but had no adjacent land, nor a free rooftop to squat. Also, it hosted Cary-Grant type of clientele: fine ladies, real gentlemen, and all that jazz. But somehow, hotel arranged a free socializing space on its patio, exclusively for guests staying at, and still managed to be super-budget about it. That’s how a glamping-style lounge was created, in maybe a day. Some notable guests flocked to what turned out to be one of the most vibrant chill-out zones in the area, blending classic mountain cottage design with hi-tech functionality. Hotel guests indulged in a relaxing atmosphere pervasive in the glamorous details of lush carpets, furry cushions, soothing music and soft candle light. In 2016, hotels wave farewell to a restaurant in a traditional sense. First, chefs will be changing their work space often and setting up temporarily at hotels. Second, restaurants will pop up in similar manner, as glamorous outdoor venues with periodic dining concepts on their menu. In many ways, this approach is inspired by glamping practices: showcasing new tastes, serving 5* dining experience, educating through outdoor cooking. Well-established hotels are now offering new eateries focusing on the mind and the body. Palazzo Versace has just opened its new Enigma restaurant where chefs will be changing with seasons, along with the menu cards. René Redzepi, chef and owner of Copenhagen’s Noma restaurant, ran a portable pop-up at Claridges hotel in London for 10 days. Then, he pursued the dream and took the entire team and food philosophy to Tokyo where he opened a monthly version of his 3-star Michelin restaurant in the Mandarin Oriental hotel. Glamorous pop-up restaurants offer hotels the chance to refresh their image and service repertoire without all the investment and risk of opening a physical restaurant. Same applies to cafeterias, bars and even hotel’s own greenhouses. Many such facilities are installed inside glamping tents. Hotels which call the shots put a strong focus on healthy lifestyle and locality. Sustainable food sourcing has stopped being the province of organic farms and glamping sites, and is gaining a more prominent spot in the hotel policy. With many vacationers looking to experience glamping first-hand, hotels meet them halfway by taking them back to the roots, (like literally). There are venues where people forage for their own food (with chef, if they are lucky). An Atlanta hotel grows its own veggies and herbs, later serving them to guests and even selling honey made by onsite bees. Upscale vacation properties cultivate their crops in specially-designed dome greenhouses, reducing to minimum the distance at which the food is served to guests’ table. Hotels which produce their food sustainably cannot complain about the benefits of such actions: better quality of food and service, lower operating costs, no packaging or buying seasonally, increased customer loyalty, stronger marketing asset. Customers are in want of food transparency and real information, such as, where exactly do their dishes come from. Hotels having the superior service in the form of sustainable and local food sourcing have the high ground against competition.